Located in the southwest of China, Yunnan province is one of the most popular destinations for travelers from home and abroad. With an area of 394,000 square kilometers, Yunnan is famous for its natural scenic spots and various geographies. Traveling to Yunnan is the best way for tourists to enjoy the charming sightseeing and explore the ancient culture in such a multiple ethnic place. In Kunming, the capital city of Yunnan, you must be obsessive about the Stone Forest. In Lijiang, you may indulge in rowing the bamboo raft. In Dali, you will have a intimate contact with its traditional culture. In Shangri-la, you will fall in love with the wonderful scenery. Located in the west of China, Tibet Autonomous Region is a lifetime and a holy place for most travelers. With an area of 1,200,000 square kilometers, Tibet is close to Yunnan province. It is the highest point of the world with grand mountains, peaceful villages, zigzag roads and snow-capped mountains. Every year, numerous travelers rush to Tibet in order to explore Tibetan mysterious culture and beautiful scenery. Traveling to Tibet from Yunnan is the best way for tourists to enjoy the diverse landform, multiple wild animals, and obsessive nature. As a professional travel agency, we at Great Tibet Tour customizes packages of Yunnan Tibet tour. Join our groups, have a nature experience. Travel Tips: It’s inaccessible for travelers to travel to Tibet from Yunnan by direct train at present. Thus, there are two ways for travelers. The one is to take flights to Tibet from Kunming, Lijiang, and Shangri-La. The other is to take flights to Xining from Yunnan, then transfer a Tibet train from Xining to Lhasa. This tour of Yunnan and Tibet allows you to explore the kaleidoscope of beauty of Tibet and the Yunnan Province, including the old towns, lakes, national parks, stone forests, pagodas, and majestic mountains, and historical sites. This tour package will lead you to the charming Lijiang and mythical Shangrila and then fly to Lhasa to view famous monasteries and sacred Yamdrotso Lake. This route is absolutely a paradise for photographers. How to get to Tibet from Yunnan? You can take a direct flight from Kunming, Lijiang, and Shangri-La in Yunnan to Lhasa in Tibet. Currently, there is no train from Yunnan to Tibet. If you want to experience the world's highest railway - Qinghai Tibet Railway, you can fly to Xining and then take the train to Lhasa. 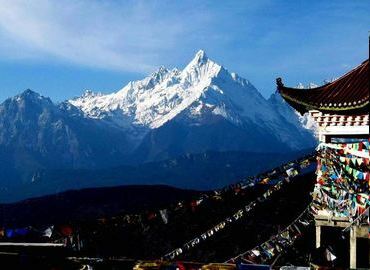 How to Get Tibet Travel Permit in Yunnan? You can’t apply for the Tibet Permit in Yunnan, but through a Tibet travel agency. If you choose Great Tibet Tour, we can help you get your Tibet Permit before you board the plane or train to Tibet. Usually, it takes 6 to 12 working days to apply for the permit, and about 3 days to deliver it from Tibet to Yunnan by express. So, after booking your Tibet tours, please send your photo copy of your passport and Chinese visa at least 20 days before your departure. If you have some special requirement, we can handle the urgent permit for you. What’s the airfare from Yunnan to Tibet? Generally, a flight ticket from Yunnan to Tibet costs about 1000 CNY or 150 USD. But this airfare is only for your reference, you can check the real-time airfare online. How far is the airport from the city? When you fly from Yunnan to Tibet, you will land at Lhasa Gonggar International Airport. The Lhasa Gonggar International Airport is located 68 kilometers southwest of Lhasa. 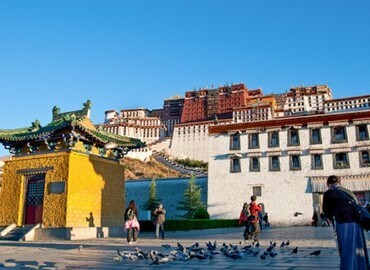 It is less than a 1 hour drive on an expressway from the airport to Lhasa downtown.